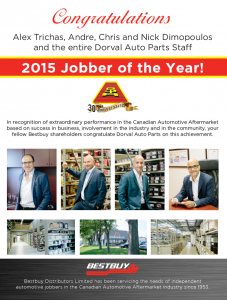 Dorval Auto Parts awarded 2015 Jobber of the Year! On behalf of everyone at Bestbuy, please join us in extending congratulations to Dorval Auto Parts on their selection as the Jobber News, Jobber of the Year for 2015. This is a very prestigious industry honour that recognizes the leading jobbers in Canada and it’s certainly something that the entire team at Dorval Auto Parts can be very proud of. Congratulations to the entire Dorval family, we are certainly happy and proud that you are a part of our Bestbuy group! Bestbuy Distributors Limited represents independent automotive wholesalers in the Canadian automotive aftermarket. Bestbuy’s greatest strength is purchasing power, giving member shareholders the power to compete more profitably – not only in buying products at a better price, but also selling them at a better price.